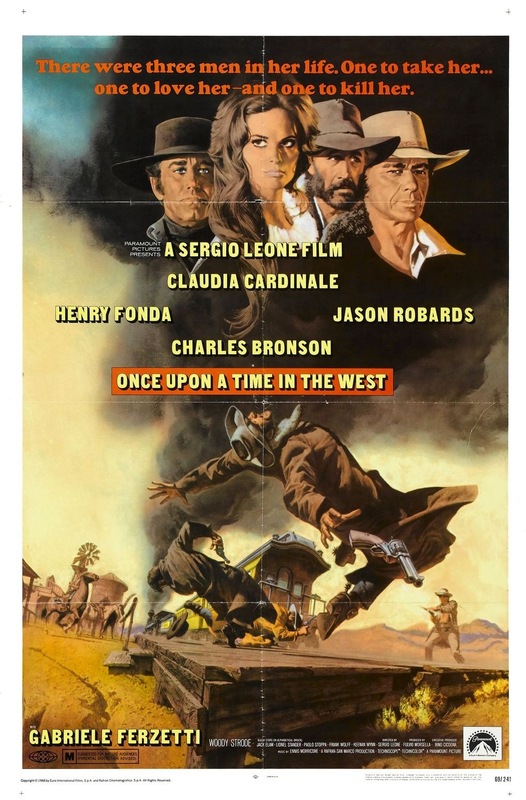 Released in 1968 Once Upon a Time in the West was Sergio Leone’s 2nd epic with the first being The Good, the Bad and the Ugly and by many Once Upon a Time in the West is not only seen as one of the greatest westerns, but also one of the all time great films. With A Fistful of Dollars the first film in the Man with no Name Trilogy is when Sergio Leone really arrived as a filmmaker and what I love about watching the trilogy and Once Upon a Time in the West was the evolution of Leone as a filmmaker. A Fistful of Dollars was a good film, but it was a little rough around the edges, but you could really see something special in Leone. For a Few Dollars More the production values went up, the writing was sharper and Leone’s direction was a lot more improved as well and than came The Good, the Bad and the Ugly, which from a technical side was by far the best of the trilogy and Once Upon a Time in the West again speaking from a technical side was the overall better film. Of the 4 films For a Few Dollars More was my favorite and it is possible for one film to be the better made, but not as enjoyable. That’s not to say I disliked The Good, the Bad the Ugly or Once Upon a Time in the West, but For a Few Dollars More would rate as my favorite film by Sergio Leone. When I reviewed The Good, the Bad and the Ugly I mentioned how when a film goes top far over the 130-minute mark I am a little weary with a few exceptions of course and even though I loved the film I did feel the just under 3-hour running time was a little overly long so I also was a little weary of Once Upon a Time in the West since it ran at 166-minutes. 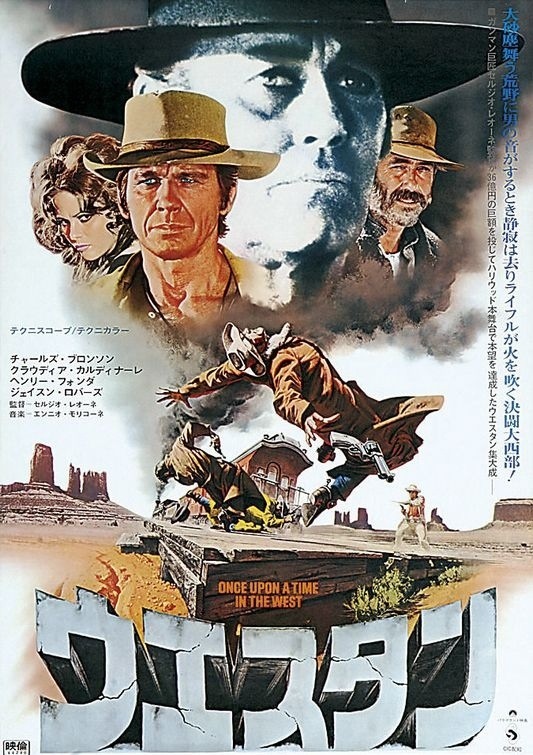 To me Once Upon a Time in the West is one of the greatest films and one of the greatest directed films and quite honestly the only thing that keeps me from giving it the full 5-star rating was I did find the film to be a little overly long and even though I was never bored I did feel though as if it could have been a bit shorter. The debate between man fans of Sergio Leone is, which film was better between The Good, the Bad and the Ugly or Once Upon a Time in the West and on the IMDb top 250 The Good, the Bad and the Ugly does rate higher, but there are many myself included who prefer Once Upon a Time in the West, but really a case for either film can easily be made. As a film buff of all eras and countries when I watch films like Once Upon a Time in the West it makes me sad when watching more modern films. Movies like this are truly a thing of the past and what’s even sadder is how a modern audience would watch this and dismiss it as boring. Once Upon a Time in the West has plenty of action, but no it isn’t the most exciting film in that regard, but at the same time it’s not just meant to be an action film. But films like this really do make me sad on how modern films have gone. The plot focuses on an outlaw Frank (Fonda) who brutally guns down a family in an attempt to get their land and Cheyenne (Robards) is set up for the crime and he teams with a mysterious man with no name (Bronson) who is dubbed Harmonica in an attempt to help a widow Jill (McBain) keep the land while Cheyenne clears his name and Harmonica gets his revenge. The screenplay was written by Sergio Leone & Sergio Donati and the film is well plotted, but like I said in my review for The Good, the Bad and the Ugly in terms of writing the main plot and subplots didn’t warrant a film just under 3-hours and I could say the same about this one, which clocks in at 166-minutes. However both films still feature terrific writing and the length of the film never really hurts the film even if it could have been shorter. Characters are excellent with plenty of depth, which is a mixture of the writing, direction and acting. Leone’s Man with No Name trilogy also called the Dollars trilogy, Eastwood actually has a name in all three that was a marketing gimmick when released in the US and if anything Once Upon a Time in the West is the real Man with No Name since we never find out Harmonica’s real name. Harmonica is one of my favorite Leone characters. We know nothing of him though it isn’t hard to figure out his motive even if not fully revealed until the end, but we know nothing about him, but yet the character is filled with depth thanks to the direction by Leone and Charles Bronson. In some ways the script mirrors For a Few Dollars More in regards two guys team up to take out an outlaw and in For a Few Dollars More Lee Van Cleef has a personal vendetta against the outlaw and it isn’t revealed until the end just like how Harmonica has a personal vendetta against Frank. Once Upon a Time in the West features a truly fantastic screenplay and it’s something screenwriters should study. As director Sergio Leone does a brilliant job; the opening 15-minutes is text book filmmaking. It features very little dialogue and there are several minutes without any, but Leone’s direction, the acting and sound F/X, which play a huge part really elevate the opening. Three guys show up waiting for the train to arrive we have no idea who they’re waiting for and we don’t know why exactly, but we do know whatever it is it isn’t good and these scenes are some of the best suspense and tension I’ve ever seen and I’ve said this before in past reviews for Leone films I really wish Sergio Leone would have done a horror or thriller film since the suspense he’s able to capture on film is better than most horror filmmakers. For a modern audience I’m sure they would be a little bored and wouldn’t quite grasp what Leone was doing, but the opening 15-minutes just might be the best directing I’ve ever seen. The next 10-minutes are equally as strong as we have a family brutally gunned down including a child. Killing children in film is something we don’t often see, but when done it’s always shocking. Films like Psycho and even films by schlock filmmaker HG Lewis started to take filmmaking in a new direction and the late 60s and throughout the 70s we saw these rebel filmmakers not afraid to push the envelope and shock the audience, but killing children was still something rarely seen in an era where again filmmakers pushed the boundaries. In Once Upon a Time in the West the cold blooded killing of a child is quite unsettling and shocking and Sergio Leone shows he’s a filmmaker not afraid to take chances. After the first 25-minutes, Leone settles things down and the film plays at a slower, but equally as steady pace. Leone gets the most out of each scene and really crafts some truly memorable characters. However the last hour is when the pacing can get a little sluggish at times, perhaps that isn’t the right word since I was never bored or anything, but the film does start to run out of a little steam, but again I wasn’t bored. Leone though gets things back on track in the final act and this in my opinion is one of the very best directed films I’ve ever seen. Sergio Leone shows again why he’s a master at his craft. When it comes to the career of Charles Bronson the first thing people will think of is Death Wish and that’s fair enough as its an excellent film with fun sequels. Death Wish is probably the best Bronson film, but not his best overall as he’s starred in many classic films as part of an ensemble such as the Great Escape and the Magnificent Seven. Of all his films like I said the best Bronson film is Death Wish, but his best film in my opinion was Once Upon a Time in the West. After the success of Death Wish it seemed every character he played was a variation of Paul Kersey and he’d play that role a total of five times. People sometimes forget Bronson was a very good actor and while he didn’t always show the most emotion he’s one of the very best film tough guys along with the likes of Eastwood, McQueen and Lee Van Cleef. As much as I enjoyed his films in the 70s after Death Wish and his work in the 80s he didn’t always have the best material even if the films were a lot of fun, but when given a great script, Bronson was a terrific actor and he’s great here as Harmonica. Charles Bronson really brings a lot of depth to the mysterious man with no name. 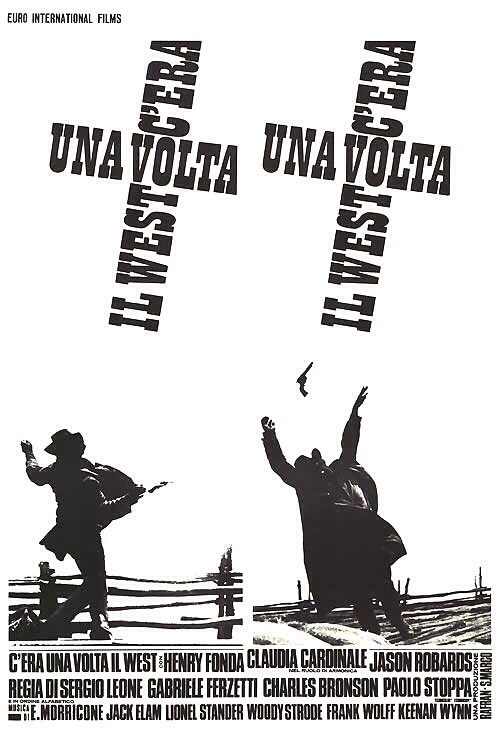 Overall Once Upon a Time in the West is truly a great film and quite an achievement in the career of Sergio Leone. While I did feel the 166-minute running time was a little longer than need be and the only reason it doesn’t get the full 5-star rating I was never bored and while again For a Few Dollars More is my favorite Leone film he outdid himself here with the overall production. 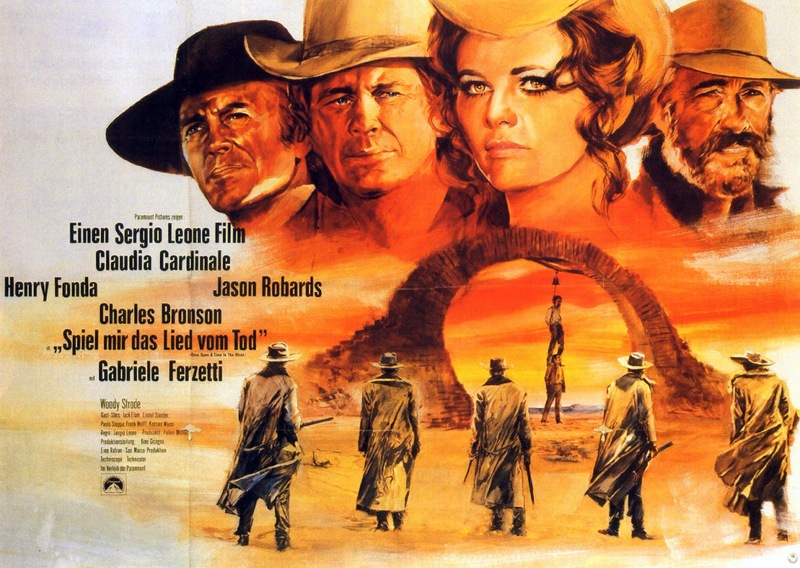 Once Upon a Time in the West is a legendary film for many reasons, but for horror fans Dario Argento has a story credit here and its one of his earliest works in film and 3-years after this he would write and direct Bird with the Crystal Plumage in 1971, which was his first film and like this film was also scored by Ennio Morricone. 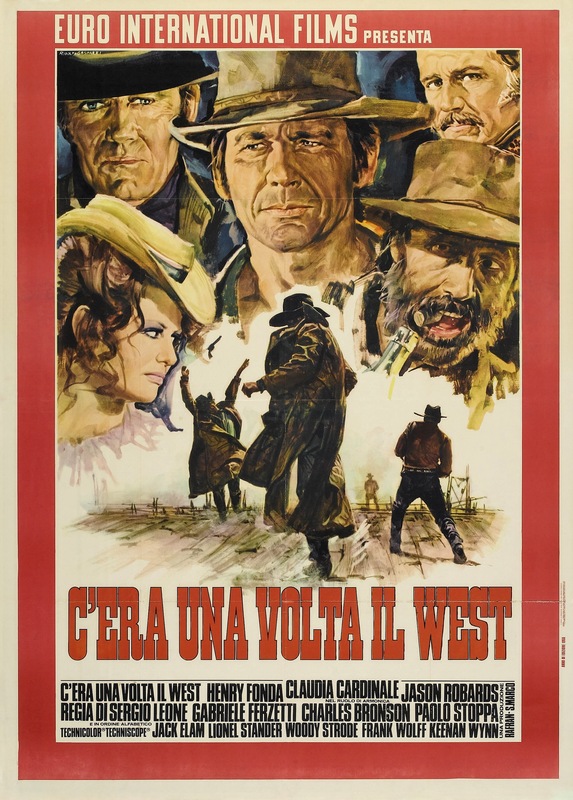 Also Giannetto De Rossi best know for his makeup F/X on such Lucio Fulci films as Zombie, The Beyond and House by the Cemetery to name a few also worked on Once Upon a Time in the West on the makeup.